For the rest of this summer, we will operate on a once-a-week reduced schedule, with occasional exceptions. In panel 1 of 9, two men are standing near three bicycles. A sign announces on two lines: Bicycle Store / Premium Bikes. Man 1: Definitely get a lightweight bicycle. Man 2: Thanks so much for helping me pick one. 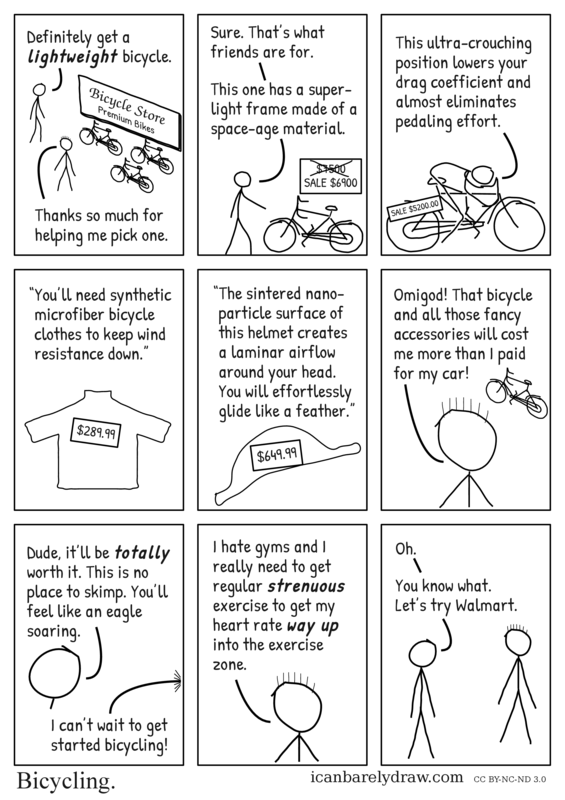 In panel 2, man 1 now stands next to a bicycle above which a sign shows a crossed-out "$7500" and below that "SALE $6900." Man 1: Sure. That’s what friends are for. Man 1: This one has a super-light frame made of a space-age material. Panel 3 shows man 1 sitting on a bicycle in a low-profile position, with back sharply bent and head positioned lower than back and close to the handlebars. Man 1: This ultra-crouching position lowers your drag coefficient and almost eliminates pedaling effort. Panel 4 shows what might be a T-shirt or short-sleeve shirt. A price label on it reads: $289.99. Panel 5 shows a low-profile helmet. A price label on it reads: $649.99. Panel 6 shows man 2 and a bicycle in the background. Man 2: Omigod! That bicycle and all those fancy accessories will cost me more than I paid for my car! Panel 7 shows man 1. Man 1: Dude, it’ll be totally worth it. This is no place to skimp. You’ll feel like an eagle soaring. Off-panel voice: I can’t wait to get started bicycling! Panel 8 shows man 2. Man 2: I hate gyms and I really need to get regular strenuous exercise to get my heart rate way up into the exercise zone. The final panel 9 shows both man 1 and man 2 standing with arms to sides. Man 1: You know what. Let’s try Walmart.